When whitetail bucks pull a disappearing act, these tested strategies for more bowhunting success during the rut can help you find them again. Will some bucks stick close to home when the rut starts? Of course. Will some wander off a bit but continually return to their late-summer/early-fall homeland? You bet. Some, however, will wander entirely off the grid. Disregard this fact, and you may be looking for a buck that has abandoned ship or taken an extended leave of absence to hang out with the “cool” crowd. A recipe exists for rut success, and it starts with an understanding of home ranges. The data on bucks traveling during the rut is extensive. Geographic location, terrain, habitat quality, deer density and numerous other variables affect how far a buck may range in your hunting locale. Want an example? A South Carolina study conducted in Dorchester County by Clint McCoy followed the movement of 40 bucks in varying age classes by GPS. More than 115,000 tracking locations were recorded, and the results from the high-quality study area showed the average home range to be about 350 acres. Older and younger bucks had similar home-range size, but their daily travel increased with the oncoming rut. Pre-rut tracking indicated bucks moved approximately 2-1/2 miles per day, but that jumped to 3-1/2 miles per day during the rut. Even with exceptional surrounding habitat, buck movement jumped during the rut. What outcomes can you draw from this? First, you may suddenly come face to face with a buck you’ve never seen before – on trail cam or with the naked eye. That’s how a lot of trophies end up on the wall and you become an overnight success. Second, you may find yourself home alone. Be prepared. To avoid days of being perplexed, put a recipe in place for rut readiness. Check the inventory of any established outfitter in whitetail country and you’ll discover hundreds of treestands in their arsenal. Outfitters equip themselves to ensure they have ample locations to put clients during the season, including when rut-roving bucks begin their home-range extension. 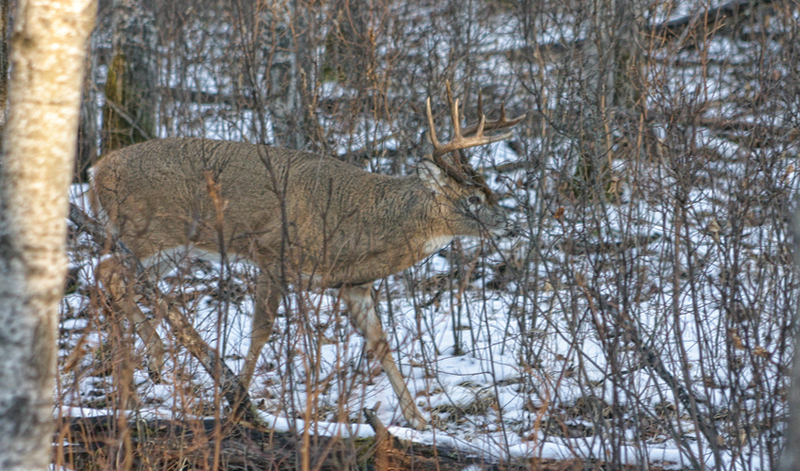 Take a cue from outfitters and add a few more hides to your rut-success recipe. A good rule to follow is to place the bulk of your stands in and around where you suspect a buck’s core area exists. Don’t push into the area too far, but set those stands up in a perimeter fashion that covers established trails with options for varying winds. Take extra stands and set another series in hunch locations where you expect wandering to take place. Keep a focus on primary food sources, doe-gathering sites and isolated escape areas where deer tend to move when hunting pressure peaks. How many extra sets should you put in place in suspected home-range extensions? That depends on your budget and time, but at minimum you should have at least four extra hides pre-set and at least that many trail cameras scanning beyond your favorite hunting zone. Some of these sites may be across neighbors’ fences, but locate travel corridors and add your own roadblock in the form of a hide. Aaron Volkmar owns Tails of the Hunt Outfitters and operates archery whitetail hunts in Iowa, Missouri and Kansas. He knows that once the rut starts it takes an aggressive approach to keep up with active bucks. There’s no guarantee you’ll find a whitetail buck once he takes on the “Where’s Waldo?” persona. Although most whitetail forays out of an established home range during the rut rarely last longer than a day, any home-range expansion leaves you with hundreds, if not thousands, of acres to sift through to find a buck. That’s where hunting partners, both carbon-based and battery-based, can help you narrow the search. Your buddies that share hunting properties with you can help with buck tracking by noting all sightings, monitoring deer-gathering locations and documenting new bucks that have moved in. Popular hunting sites like ScoutLook Weather have the tools in place to not only track all of your stand locations but to keep a log of all deer movement that can be shared between hunting partners. If you hunt in solitary fashion, then extra trail cameras placed around a property can provide the same information but with a bit more labor. And don’t forget to query landowners on recent sightings or new areas of increased deer activity. Where should you focus? You’ll want to keep tabs on gathering does and changing food sources, but define your search further with ventures into overlooked sites that you may not give a second look at any other time of the year. Ryan Basinger, a veteran wildlife biologist for Westervelt Wildlife Services, understands a buck’s tendency to disappear during the ruckus of the rut. Abandoned farmsteads, standing corn, acres of swamp, remote draws and even suburbia could all be places to snoop for a buck that has gone AWOL. If the area lies adjacent to a known home range, it only takes the concentrated scent of a group of does to attract bucks overnight.